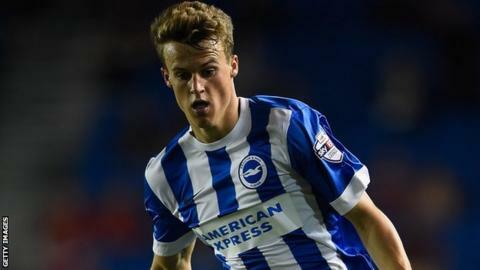 Brighton's England Under-21 winger Solly March has been ruled out for the rest of the season with a knee injury. March, 21, was carried off during the Seagulls' recent draw at Derby and a scan confirmed he suffered anterior cruciate ligament damage. "We're all devastated about it," manager Chris Hughton told BBC Sussex. "He's a young player and has been in really good form for us. How long he'll be out won't be determined until he sees a specialist. It's a real blow." Hughton's side are unbeaten in the Championship this season and face leaders Middlesbrough at home on Saturday. Tuesday's 2-2 draw at QPR, who came back from two down, meant Albion were replaced by Boro at the top of the table. "It's another big game and we'd certainly rather be playing Middlesbrough at home, first against second, than be somewhere further down the table," said Hughton. "It's a great game for the supporters and we'll need them to be as vocal as they always are."